Starts Fri., June 6. Regent Square. British illustrator, political cartoonist and provocateur Ralph Steadman seems like an interesting guy. His artistic career is in its fifth decade, and he seems to have achieved his goal of using his provocative drawings "as a weapon, [that] people would see and think about," and made a good living doing so. 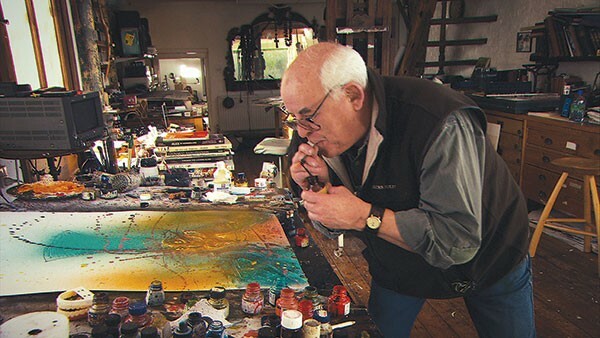 I say "seems," because Charlie Paul's documentary about Steadman is less about traditional biographical data than about just hanging out with the loquacious artist. The film takes us through some highlights of Steadman's career, most of which seem to include lowlights with frequent collaborator Hunter S. Thompson; they first worked together on Thompson's 1970 piece about the Kentucky Derby, which kickstarted "gonzo" journalism. Steadman also spends time demonstrating his artistic process — from ink splat to finished portrait — which is pretty fascinating. It's essential stuff, if you're a fan of Steadman's work, but not very helpful as a primer to newcomers. We're joined in Steadman's studio by Johnny Depp, whose presence is never explained. Depp did star in the 1998 film version of Fear and Loathing in Las Vegas, the Thompson gonzo classic that also featured Steadman's illustrations. Perhaps this is why they're friends. In any case, Depp does open the film with an epic humblebrag: "I haven't seen Ralph since the signing of Hunter's memorial poster."